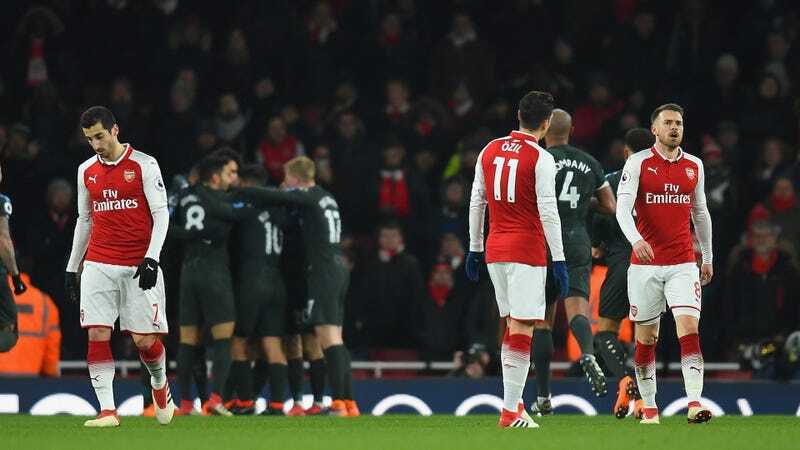 Manchester City ground Arsenal to bits this weekend in a League Cup final that was deeply embarrassing for the Gunners’ players, manager, and anyone who loves them. Today’s midweek Premier League clash at home against the same opponent offered the wounded Londoners a shot at redemption. Instead, City ran Arsenal off the pitch in even more devastating fashion than last time. What’s crazy here is that Arsenal didn’t even really play poorly. They were able to work the ball into dangerous positions with some regularity, for the most part withstanding City’s terrorizing high press and keeping hold of the ball just about long enough to make something happen in attack while preventing the Citizens from torching them the other way. Unfortunately for Arsenal, this didn’t really matter. Because once City did get the ball, they were unstoppable. There’s not much you can do when City play like they did in that first half. The accuracy of the passes, the intelligence and abundance and speed of the off-ball runs, the impossibility of taking the ball off their half-dozen dribbling wizards, the defense-rending nature of their cross-field passes—the effect of it all has to be absolutely bewildering for teams confronting City at their best. At all times there are threats everywhere on the pitch and never enough defenders to neutralize them all. It’s quite something to watch. City can play way worse than this and still cruise to the Premier League title behind their 16 point lead on Manchester United in second. If they play as well as they did today, they’ll be favorites to win the Champions League. Arsenal, meanwhile, will have to improve on their two consecutive defeats to the Sky Blues if they have any hope at all of ending the season in anything other than abject failure. Ten points out of fourth place with ten matches to go, they’re already out of realistic contention for the Champions League places, so what happens in the league doesn’t really matter. They still have the Europa League, though, and they’ll have to win that competition to play with the big boys in Europe next season. Doing so might not—and it probably shouldn’t—be enough for manager Arsène Wenger to keep his job, but at least it would be somewhat respectable. Luckily for them there isn’t another team out there that can destroy Arsenal or any other team in the world with as much assured mastery as City just did.